Master Dutch watchmaker Christiaan van der Klaauw specialises solely in the design and manufacture of astronomical watches and now presents what will be the first piece in a series of twelve unique watches: The Aquarius Planetarium. 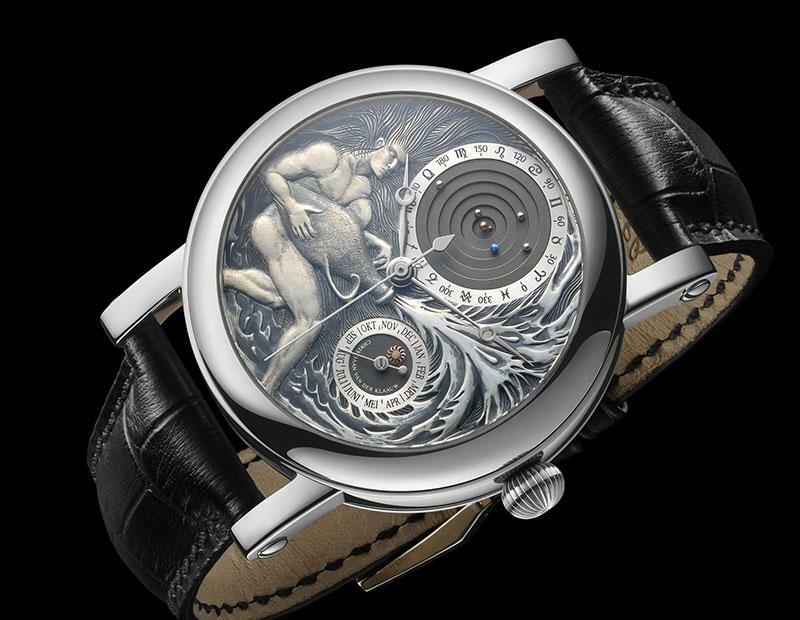 It is based on Christiaan van der Klaauw’s famous Planetarium watch, featuring the world’s first and smallest mechanical planetarium, showing the cycles around the Sun of the planets Mercury, Venus, Earth, Mars, Jupiter and Saturn. 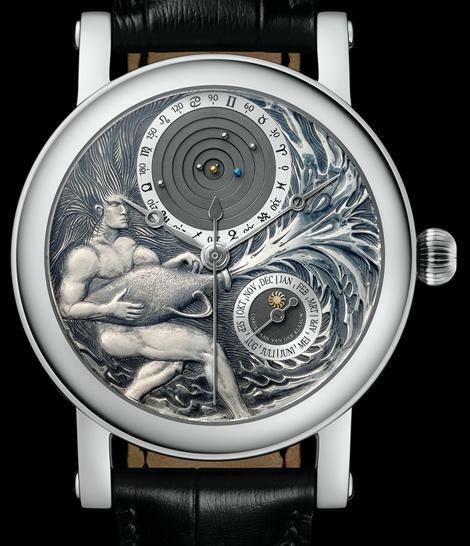 The solid gold dial shows one of the twelve constellations, in this case Aquarius, and is engraved by master-engraver Kees Engelbarts. The case is made of platinum and measures 40mm in diameter. It’s fitted with a sapphire crystal on both sides. Only one watch will be made of each zodiac sign, ensuring total exclusivity. Every watch will be a ‘pièce unique’ and a collector’s item by its very nature. The other zodiac signs will only be made by special order. The watch runs on the CK 1196 calibre movement, which is a modified self-winding movement, with an in-house Planetarium module. The back of the watch reveals a fine rotor, based on the theme of the Planetarium, in which the planets of our solar system are visible. The rotor is made of 18-carat gold and hand-engraved by Jochen Benzinger. The Aquarius Planetarium and versions showing other zodiac signs, will be available for €79,500 (including taxes). The Christiaan van der Klaauw website, have created a flash animation that shows exactly how the planets of the planetarium orbit around the sun. 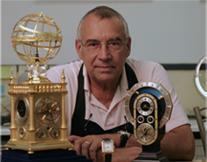 Christiaan van der Klaauw started designing and making exclusive hand-made astronomical timepieces in the early ‘70s. He received his education at the instrument-maker school founded in 1901 by Nobel Physics prize winner Professor Heike Kamerlingh Onnes. It was at this school that helium gas was liquefied for the first time in 1908. Some contemporaries who worked for the same laboratory included Albert Einstein, Niels Bohr, H. Lorentz and W. Röntgen. During his education, Christiaan served his apprenticeship with the oldest observatory in the world, founded in 1633. The world-famous astronomer Professor J.H. Oort (who discovered the Planetoid belt named after him) was attached to this observatory. During his apprenticeship, Christiaan became increasingly interested in everything connected with astronomy, which showed later on in the production of his Frisian clocks, table clocks and, eventually, his watches.